The BHS Cylinder Transporter provides a safe and efficient way for staff to transport compressed gas cylinders. Because industrial compressed gas cylinders can be dangerous when handled improperly, it’s important to choose transport equipment you can trust. Our Cylinder Transporter has a heavy-duty steel frame to ensure rugged durability. Its protective powder coat finish resists scratches and allows it to perform inside and outside. Formed steel retainer bars are hinged and pin-secured between compartments to hold gas cylinders firmly in place. Bars quickly release from either side to streamline loading and unloading. The Cylinder Transport offers a unique blend of security and ease of use. Staff can easily maneuver the Cylinder Transport using its four 6-inch, polyurethane casters (two swivel and two rigid with brakes). 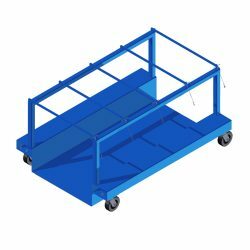 When job site conditions prevent easily rolling the Cylinder Transporter, two fork pockets allow staff to relocate the cart with a lift truck. Cylinder Transporters come in three sizes of varying widths and lengths. Find the perfect one for your operation and make transporting compressed gas easy. Industrial compressed gas cylinders contain flammable, corrosive, and poisonous gases. Protect your staff from injuries caused by mishandled industrial compressed gas by investing in a heavy-duty Cylinder Transporter. Contact our sales team at 1.800.BHS.9500 to learn more about Cylinder Storage and Transport Equipment or to locate your local dealer.